Antique utilitarian stoneware can run the gamut from mediocre to megabucks in terms of how much a piece is worth. The value will depend greatly on the piece's age, decor, size, and maker. To help you get started in valuing your stoneware, this guide can assist you in identifying similar pieces in comparable condition. The two-gallon jug above is signed "Robert Binghamton NY." It features blue painted bird decor and is 14 inches tall. This piece does have a quarter-sized chip and a few spider cracks. It sold for $360 at Morphy Auctions in 2012. This large stoneware crock with two handles and blue freehand decor. It is 16 1/2 inches tall and has two 10-inch cracks and a few rim chips. 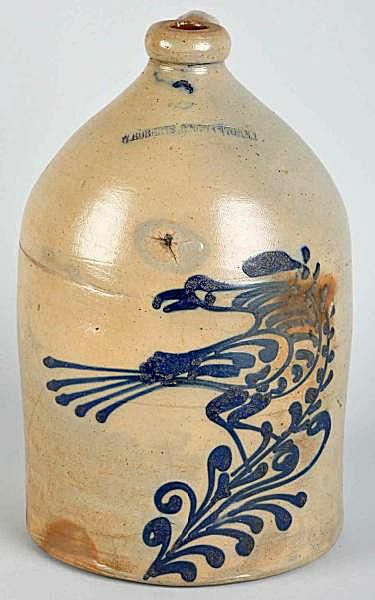 Despite that, stoneware crocks are sought after, so this piece sold through Morphy Auctions for $240 in 2012. A five-gallon stoneware crock with blue chicken decor, this piece is in excellent condition. It has no cracks, repairs or chips. At 13 1/2 inches tall, it is nicely sized and the two handles add to its value. The 2012 selling price through Morphy Auctions was $780. A four-gallon stoneware crock, this piece is from Pittston, Pennsylvania and marked with the name Evan Jones. The artwork depicts a bird on a stump in blue. There is a crack on one of the sides near the handle that runs from top to bottom. However, it is still structurally sound. It also has several small chips on the inside of the rim. The 11 1/4-inch tall crock sold in 2011 for $720 through Morphy Auctions. A rare find that appeals to photography as well as stoneware collectors, this five-gallon stoneware jug apparently once held photographic chemicals. It is marked Eastman Kodak Co., Rochester, NY. The 18 1/2-inch jug is in excellent condition and sold for $180 through Morphy Auctions in 2011. A 20-gallon jug with two handles and a spigot at the bottom, this piece is 25 inches tall. It is decorated with a raised emblem of Santa Claus, which may be an unidentified maker's mark. In excellent condition, its 2009 selling price through Morphy Auctions was $936. A West Troy Pottery piece of stoneware, this two-gallon jug has a single handle and blue floral decoration. There is a chip on the mouth but no cracks or repairs, so it's considered to be in very good condition. It sold for $292.50 in 2009 through Morphy Auctions. A set of three crocks with handles and blue decor, a lot like this is a nice way to start a stoneware collection. The largest piece is 11 inches tall and all are in excellent condition with no cracks, chips, or repairs. Morphy Auctions sold this set in 2009 for $263.25. Spatterware is a decorating technique that can be found on some stoneware pieces. This particular lot included two pitchers, the largest of which is 11 1/2 inches tall. The blue pitcher has large chips on the top rim, and the brown and green pitcher has one small inner rim chip. The pair sold for $58.50 through Morphy Auctions in 2009. A classic piece, this two-gallon jug with a handle and blue floral design is marked Port Edward New York. There is an evident old repair to the mouth, but no cracks. It's considered to be in good condition. The 15-inch tall jug was valued at $117 in 2009 by Morphy Auctions. This is a rare example of a Hires Rootbeer mug with deep blue glazing. In excellent condition with no chips or damage, it stands 5 1/2 inches tall. In 2009, Morphy Auctions sold the piece for $204.75. A stout 12-inch tall jug with a handle and blue flower decoration, this piece is marked N. Hastings, New York. No chips, cracks, repairs, or damage are apparent, so its condition is excellent. It fetched a selling price of $204.75 at Morphy Auctions in 2009. In near-mint condition, this set of stoneware root beer bottles is a fun lot. It included three Old Fashioned Root Beer bottles and one each of Dr. Swett's Original Root Beer and Moo Cow Ginger Beer. The largest bottle is 7 1/2 inches tall and the lot sold in 2009 for $175.50 through Morphy Auctions. Made by Weirs Pottery Co. of Monmouth, Illinois, this stoneware bowl features a Native American figure and decor in blue paint. These pieces were given away as premiums in flour sacks by Sleepy Eye Milling Co. and date between 1883 and 1921. In near-mint condition, the bowl measures 4 by 6 1/2 inches. It sold for $409.50 in 2009 through Morphy Auctions. This four-gallon jug with a handle features a whimsical hand-painted blue design. It is from West Troy Pottery and stands 18 inches tall. There are no chips, cracks, or repairs and it is in excellent condition. The 2009 sale price through Morphy Auctions was $292.50. A fantastic stoneware No. 3 jug, this piece features a blue floral design. Standing 15 inches tall and with no cracks or chips, it is in excellent condition. Morphy Auctions sold this piece in 2009 for $263.25. Simple, but a good starter piece for new stoneware collectors, this is a classic eight-gallon crock that stands 15 1/2 inches tall. The condition is good with 1/8-inch crack and minor chips. It sold for $58.50 in 2009 through Morphy Auctions. A four-gallon jug with a handle and blue floral decoration, this piece is marked T. Harrington Lyons. The jug has three half-inch dings, so the condition is rated as good. Standing 18 inches tall, Morphy Auctions valued it at $234 in 2009. In excellent condition, this five-gallon, 18-inch jug has a single handle and blue floral decoration. It is marked Pottery Co. Lyons, New York. There are no chips, cracks or repairs, which helped it sell for $234 through Morphy Auctions in 2009. Two beer steins and one small pitcher were included in this lot of near-mint stoneware pieces. Each piece has great embossed images, including a Native American chief, a golfer, and a country scene. The largest piece is 7 3/4 inches tall. As a lot, Morphy Auctions had this valued in 2009 for $234. R. Mugler & Co. of Buffalo, New York produced this beautiful example of a two-gallon jug. It stands 15 inches tall, includes a handle, and is decorated in a stunning blue floral design. The condition is rated at very good due to one small chip on the bottom. Yet, it sold in 2009 for $643.50 through Morphy Auctions. There are other types of collectible china, pottery and more.